got some redcurrants . not sure what to do with them ... yet! + the little porcelain bowls I used for tests are a giveaway . just leave a comment with a suggestion for the redcurrants . until sunday 15th July midnight (london + lisbon time) . GOOD LUCK! comprei groselhas . não sei bem o que fazer com elas ... ainda! + as tigelinhas de porcelana que usei para testes são oferta . deixem um comentário com uma sugestão para as groselhas . até domingo dia 15 de julho à meia noite (hora de lisboa) . BOA SORTE! what about a red currant jam? que tal um simples e nutritivo pequeno almoço (ou lanche) com iogurte, groselhas (ou mistura de frutas) e bolacha ralada? One of my favorites is red currant tart. Red currants are hard to find so I never get to indulge! 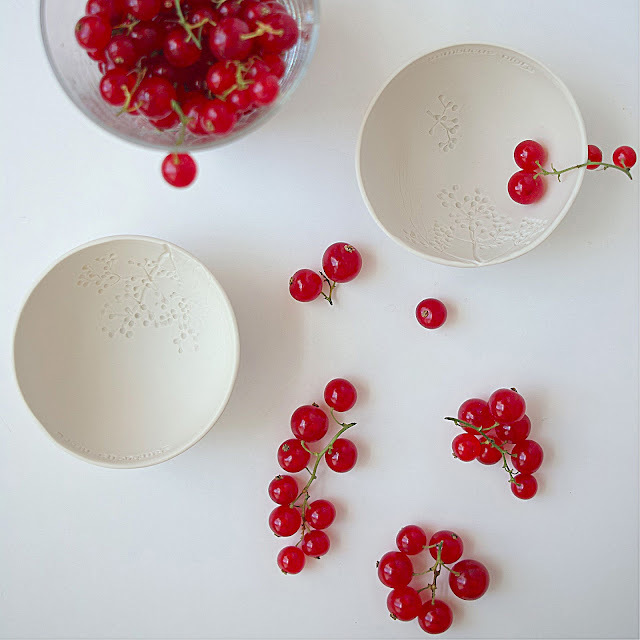 The white bowls are so delicate and beautiful and the currants look so pretty with them. Your giveaways are always amazing! I haven't tried this receipe yet but it's in my "to do" list! I love sweet/sharp contrast of red currants and tart. Hmmmm...what would I do with fresh red currants. I would wash them, put them on a cookie sheet and freeze them, whole. Oh my goodness. The thought of eating fresh red currants in January makes my mouth water. licor de groselha :) é delicioso! Iogurte grego com groselhas e nozes, e um chá (quente ou frio) feito com as folhas da groselha. E umas taçinhas com umas groselhas baixo relevo! Gostava muito de receber esta prenda tão generosa! Red Currant Cocktail: 2 parts freshly squeezed red currant juice, 2 parts vodka or gin, 1 part dry vermouth, splosh of lime juice, shake with ice. sprinkled on a pavlova (meringue and whipped cream)- yummy!! Make an English Summer Pudding! Use red/black currents, strawberries, & raspberries to make this very easy but impressive desert. There are many recipes available on the web! Não tenho. Sugestões. Mas adorei as taças! Parabéns! I would go with adding the currents to a summer pudding or maybe a splash of red current juice in a glass of champagne or prosecco. eu faria um piquenique catita, convidaria uns amigos e fazia um lanche junto ao rio. Comia umas groselhas vermelhuscas e saborosas (aposto) numa dessas taças magnificas. Porque esta coisa das coisas bonitas e saborosas tem mais piada quando é partilhada. I would dry them in a low oven and use them to sprinkle on my breakfast oatmeal/yoghurt in the winter months! If I had some red currants, I'd make a simple syrup with them (there are some great recipes on the Internet) and then pour the syrup over vanilla ice cream! as taças à semelhança do que sempre faz são lindas! Groselhas crocantes feitas em caramelo caseiro, deixalas emfriar num prato apartadas grao por grao e adicionalas numa tarta de queijo, o sabor do crocante com o queijo e um puro delicio mas tambem se mode adicionalas em qualquer doce. Para ser franca minha primeira ideia foi pensar numa ideia de porcelana com as groselhas, tipo os raminhos ou as andorinhas. Foi quando vi os comentarios que musée por esta receita muito simples e sempre boa. Obrigada por este novo giveaway. Break the eggs in a large bowl. Add the sugar and with a hand mixer, beat until whiter in color (you can do this in a Kitchen Aid if you have one). Melt the butter and once slightly cooled, add it, mixing until absorbed. Your batter should be smooth. Remove the seeds from a vanilla pod and add them to the previous batter. Sift the flour with the baking powder. Add them to your batter and mix until incorporated. Pour the milk slowly while mixing. Grease six small 1 cup ramekins (or use large muffin molds) and then add some flour to coat. Remove the excess of flour. Fill them 2/3 full with the batter. Add as many red currants as you like. Cook in a preheated oven at 350 F for about 30 to 35 min. Check whether they are cooked by inserting the blade of a knife. If dry, then remove and let cool for 5 min before unmolding. You could make a rice milk ... in this way! Put to boil the milk with the rice, sugar, vanilla bean open and half the cream until the liquid is completely absorbed. Put to cool in a bowl and add the remaining cream. Chill in the refrigerator and when you serve add the currants.